Perry Rhodan model kits are arguably the best fictional space craft series on the market. For my sins I was given this model over a month ago to complete, but I was a little lazy, wanting to ensure that I gave myself a full day to tackle it. I was never the world's best model builder and spent the majority of my childhood scrapping glue from my hands, the table and most of the rest of my parent's furniture and managed to fail to get any of it to stick my models together. I never bought a model myself and it always seemed that I was only given them as birthday and Christmas presents. So imagine my shock at being given this model to stick together by my reviews editor. Thankfully, as I now live away from home my parents no longer need be in fear of me ruining their best furniture. But hey! Wait a minute this is actually quite good fun, and I'm actually quite good at this now. 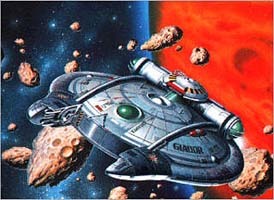 The Perry Rhodan Space Jet Glador set is pretty damn good and I am proud of my achievements with the kit. It has actually got me in to model making in a big way and I am currently in the process of trying to get my young nephew interested as a hobby. Thanks Revell for helping to bring me back in to the fold - this Perry Rhodan kit is a complete joy to construct - and now I have a great model to show off to my guests.